The idea for Cherry Hill Designs® began over twelve years ago when I couldn't find affordable, modern invitations for my wedding. So I eventually launched a little website offering custom invitations and stationery – with a few, cute sippy cup labels on the side. 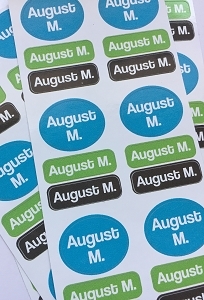 It wasn't long before demand for our cute, dishwasher-safe name labels eclipsed demand for all other products, so we launched an extended line of stylish labels on Cherry Hill [email protected] and began selling name labels and adorable monogrammed gift items in boutiques across the nation. Almost ten years later, our little label business has grown, but we still hand-make our labels and custom monogrammed gift items from our studio in Aubrey...in the center of North Texas' beautiful horse country near Dallas/Fort Worth. We hope that you enjoy using our custom monogrammed products as much as we enjoy making them for you. PS. Check out our sister shop rouge & co. for more stylish, monogrammed techie, lifestyle and home accessories for grown ups. You'll find great gift ideas there too!